6/24 Cup of Coffee: The Sea Dogs' roster continues to fill with new names and top prospects as both Mauricio Dubon and Jalen Beeks (pictured) made their debuts for Portland on Thursday. The Drive pounded out 13 hits, including a big night from Tate Matheny, but still fell in extras. The Spinners continued their impressive start to the season with some extra-inning magic, courtesy of Chris Madera. The rehabbing Brock Holt caused a stir in a loss for Pawtucket, but not because of his bat or glove. A five-run second inning did in the PawSox, as the offense struggled to get going. Ryan Hanigan, making a rehab start as the designated hitter, had Pawtucket's lone extra-base hit and RBI of the night with a run-scoring double in the third. Rusney Castillo went 0 for 4 out of the seventh spot in the lineup. Justin Haley was touched for six earned runs on four hits in 5 1/3 innings of work, walking three and striking out six. Brock Holt had a rough night as part of his rehab stint, making a key error in the second inning. He was then ejected from the game for apparently arguing balls and strikes after striking out in the bottom of the third. Just two nights after Yoan Moncada made his Double-A debut, two more prospects got the call for the first time in Portland. Jalen Beeks got off to a shaky start, giving up hits to the first three batters and allowing two runs. He worked through the apparent nerves, however, to rack up a career-high 10 strikeouts. Beeks ended up being the tough-luck loser, allowing four runs (three earned) on eight hits in five innings. He walked just one. Mauricio Dubon collected an eighth-inning triple for his first Double-A hit. He finished 1 for 3 with a run scored. Moncada and Andrew Benintendi each went hitless, but Benintendi did pick up his 20th RBI with Portland. Aneury Tavarez crushed his second homer of the season to dead center in the fifth. Thunderstorms in Salem caused Thursday's game to be suspended. The game will resume in the bottom of the second on Friday. Michael Kopech was scratched from his scheduled High-A debut with what the team described in a tweet as a muscle cramp. Yankory Pimentel got the start in his place. The Drive erased an early 6-0 deficit and had multi-hit nights from four different players, but fell short in extra innings. Tate Matheny led the 13-hit attack, going 3 for 5 with three RBI and a run scored. He tied the game at 7-7 with one out in the bottom of the ninth with a two-run single, but the Drive stranded the winning run at second. Austin Rei and Kyri Washington each drove in a pair. Josh Ockimey got his batting average back to .300 with a 2-for-4 night with a run scored. Logan Boyd allowed seven runs on nine hits in four innings of work. A clutch RBI single by Chris Madera in the top of the 11th carried Lowell to its seventh straight win to start the season. Jagger Rusconi followed with a two-run double to add on insurance runs. Lowell jumped out to an early 2-0 lead when five of the first six batters reached. Josh Pennington was solid in five innings of work, allowing just one earned run on two hits while striking out four and walking three. Dioscar Romero earned the win in 2 1/3 innings of scoreless relief. The Red Sox held the Dodgers to just one hit in a shortened game. Edilson Batista was brilliant in five innings of work, giving up just the one hit, striking out five and walking none. Manuel Ramirez worked around three walks to maintain the shutout and earn the two-inning save. Centerfielder Willis Figueroa provided all the offense the Red Sox would need with a two-run double in the fourth. He finished 2 for 3 with a stolen base. The second DSL team dropped a tight one, despite outhitting the Rays, 6-4. Rayniel Moreno was perfect through his first three innings of work before a pair of walks led to a Rays run. He was pulled from the game after 3 1/3 innings. Ronald Gutierrez suffered the loss in relief. Shair Lacrus was solid out of the bullpen, striking out four in two innings of work. Pedro Castellanos went 2 for 4 with a double. Player of the Night: Despite suffering the loss, a career high in strikeouts in his Double-A debut earns Jalen Beeks Player of the Night honors. Perhaps most impressive about Beeks' performance was that all 10 of his strikeouts came on swings and misses. A 14th-round draft pick in 2014 out of the University of Arkansas, Beeks posted a 3.07 ERA in 13 starts for Salem before earning his promotion. 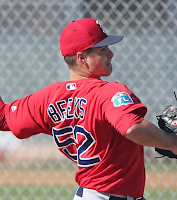 Beeks is currently ranked 29th on SoxProspects.com.